His brother, trombonist and composer Delfeayo is not so widely recognised but certainly deserves to be, judging by the depth of talent exhibited on this newly released album. So it is a pleasure to see that Delfeayo and the Crescent City-based Uptown Jazz Orchestra have produced a glittering range of styles that embrace a wide diversity (My apologies for not listing all the contributors here as there are so many of them. Buy the CD to find out!). 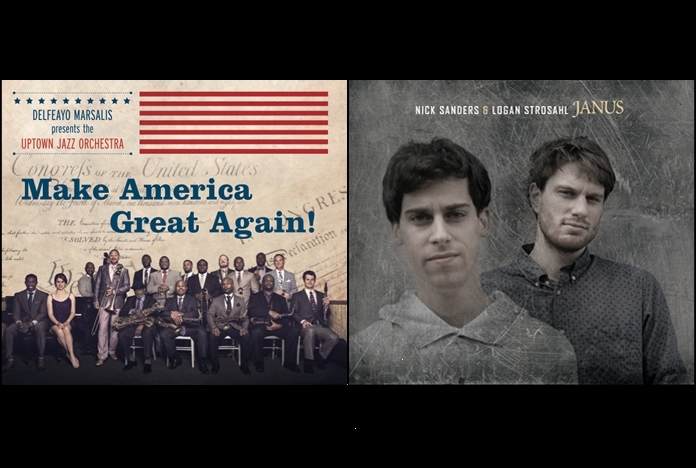 The title track Make America Great Again! is a tongue in cheek political polemic with a voice-over narrative while Star Spangled Banner offers a comparatively faithful rendition of a patriotic composition. Reverential nods are given to the great big bands of the past. Second Line inclines towards the Duke with Strayhorn echoes and lovely Hamiltonesque clarinet weaving above the choruses while Symphony in Riffs remembers the halcyon days of Benny Carter. A homage to Count Basie, All of Me, takes different approach. Sparse piano from Kyle Rousssel, more funky that the the Count ever envisaged, leads us in and, as we suspect, towards the end of the second chorus - Bang , in comes the orchestra. Delfeayo’s trombone is featured in Skylark and surely Hoagy Carmichael would have approved of the subtle, mellifluous treatment it is given? The superb 20-piece UJO has had a regular weekday workout in a famous New Orleans venue for six years. “We play feel-good music. Don’t come…if you feel like being depressed,” says Delfeayo. If ever I get to the Crescent City, count me in. A superb CD which embraces some of America’s great musical forms. Tracks: Star Spangled Banner; Snowball; Second Line; Back to Africa; Make America Great Again; Dream on Robben; Symphony in Riffs; Put Your Right Foot Forward; All of Me; living Free and Running Wild; Skylark; Java; Fanfare for the Common Man; Dream On Robben (instrumental. And now for something completely different but, in a way, the same. If, dear reader, you are somewhat baffled by the opening statement, these two young men from the opposite end of the USA to the Marsalis family, have used the jazz piano/sax duet format to embrace many different musical forms. Nick Sanders and Logan Strosahl met 10 years ago when they were both students at Boston’s New England’s Conservatory. Although this newly released album’s eclecticism ranges across the board from medieval to modern French “straight” composers to standards and originals, they never lose the appeal of improvisation in its many forms. Being basically a died-in-the-wool jazz lover I was surprised at how much I enjoyed some of the tracks. Sigma and RPD both sound like modern classics but the former is apparently based on a video game series and the latter influenced by “zombie apocalypse”. New territory for me but beautiful sounds. The title track Janus (the two-faced ancient Roman god of time) moves from bebop to out-of-tempo musings to McKenna style bass piano style with a very non-McKenna right hand - an intriguing approach. No young musician wants to sound like his Dad’s generation but the duo’s approach in Thelonious, Be-Bop and Stardust is both respectful and original. This reviewer’s favourite track is a gorgeous version of the Songbook standard Old Folks which proves that however far and wide Sanders and Strosahl venture into the musical firmament, when it comes to finding the sweet sorrow in a beautiful ballad, these boys have got it in spades. Logan is keen to point out that they are not trying to give everything a “jazz interpretation” but much of it is most agreeable to this jazz interpreter! Tracks: Sigma; Allemande; Thelonius; RPD; Mazurka; Old Folks; Be-Bop; Rose, Liz, Printemps,Verdure; Vingt Regards Sur l'infant - Jesus; Janus; Stardust; Les Amusemens.